Brazil is the largest country in Latin America and the world's fifth largest country in terms of population as well as size. Brazil recently moved one place above UK to become the world's sixth largest economy with a GDP of 2.52T USD as reported by CEBR. The Brazilian economy experienced growth in 2010 and 2011 as the rest of the world was being affected by the global financial meltdown and the Euro debt crisis; it grew by 7% and 3.5% in 2010 and 2011 respectively. The CEBR predicts that by the end of this decade, the new world in GDP will comprise of China, USA, India, Japan, Brazil and Russia (CEBR, 2011). Brazil’s economic growth has been accelerated by the emergence of the ICT sector in the country. According to recent IDC numbers, Brazil is the eighth largest IT market in the world, with growth forecast at 13% for 2012 and 42B USD in revenues. Gartner predicts an increase in total IT spending of 141B USD in 2012, from 130B USD in 2011. At the recent World Economic Forum in Davos, Brazil’s Deputy Minister of Development, Industry and Foreign Trade, Alessandro Teixeira said the ministry, "expects 2012 to be another record year for Brazilian trade". 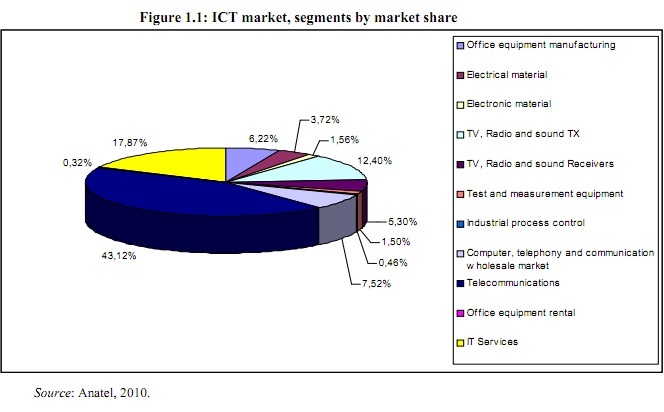 The two main segments in the Brazilian ICT market are telecom (43.12%) and IT services (17.87%) (Figure 1.1). The software and services industry experienced total revenues of 22B USD in 2011 and Schmitt, ABES director, is expecting the same pace of growth in 2012 predicting a rise of 15-20%. 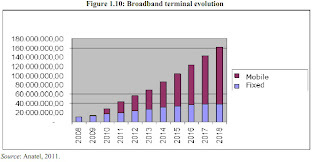 Concomitantly the telecommunications industry also experienced its best year in 2011. Teleco estimates an increase of 40 million in mobile connections (Teleco, 2011) in 2011 to 242.2 million. Also, there was an increase in demand for Brazil's pay-TV segment expanding by 29.5% in 2011 when compared to same period in 2010. According to Anatel, the country now has 20.3 pay-TV subscriptions per 100 households. Additionally IDC predicts that Brazil will be selling more mobile handsets than fixed by 2015 hailing it as the “third technological wave” of mobility (Figure 1.10). According to IDC, 74% of companies already provide their employees with some level of mobile access to corporate applications. The Brazilian ICT market is divided into several tech clusters around the country. A study by IPEA discovered that Sao Paulo had the highest number of innovative firms with 53.4% concentrated in the city; followed by Amazon (13.8%), Parana (11.7%) and Minas Gerais (9.6%). The growth and opportunities in the region have not gone unnoticed, with foreign companies investing heavily in Brazil. Among the 382 companies, identified by the IPEA survey, operating in Brazil, 16.23% were foreign and these companies accounted for over 70% of revenues. As a sign of its growing significance in both Latin America as well as the world, big corporations such as the Franco-Dutch IT Company Atos and Oracle have both pinpointed Brazil as their main focus region in Latin America with plans to invest heavily in the ICT sector. In addition to private sector investments in the region, the Rousseff government has shown positive initiatives to support the ICT sector. The communication ministry recently allocated 8.8M USD from its ICT fund to local IT and telecoms R&D firm CPqD, to invest in broadband projects. Furthermore in September 2011, the government assigned 7.2B USD from their federal budget to ICT investments and projects. The capital will go towards the deployment of fibre optic network cables as well as the national broadband plan PNBL. Moreover Brazil implemented 3.2B USD worth of tax exemptions and reductions to the ICT market to boost the pace of ICT investments. These initiatives are aimed at attracting multinationals to install factories and deploy telecommunication services in the country. Furthermore with the World Cup (2014) and Olympics Games (2016) in the horizon; there isn’t a better time than now to invest in the ICT market. Even though ICT investment in Brazil is expanding rapidly, a growing concern is the lack of high skilled labour. Gerson Schmitt, Director of ABES said, “The export market in that niche is heated, and while foreign software companies are increasingly arriving in Brazil there is an inadequate number of experts to meet the needs of this growth, and it will result in a shortage of skilled professionals." 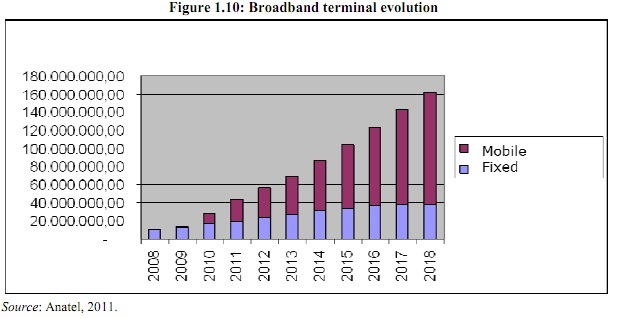 All things considered Brazil’s ICT market sector is on the rise. With the ever-present government incentives and concessions, one can expect foreign and domestic investments in infrastructure, telecommunications, and software services to continue. With the economy fairing much better than Europe or USA, big multinational corporations are turning their eyes to Brazil and the vast opportunities it provides. Lastly a striking re-occurrence is the emergence of China as Brazil’s major trading partner. Imports from China rose by 35% in 2011 to 21B USD whilst exports to China surpassing 29B USD (MDIC, 2011). Looks like that's also good news for distributors of fuses. Brazilian ICT companies are going to need a lot of hardware, and with hardware comes the risk of overcurrent; and that's where fuses come in.
. Play Run Unblocked or Run 3 Unblocked and Run 4 Unblocked Game.